and he definitely know where to go. Stylish frontside hurricane to first place. 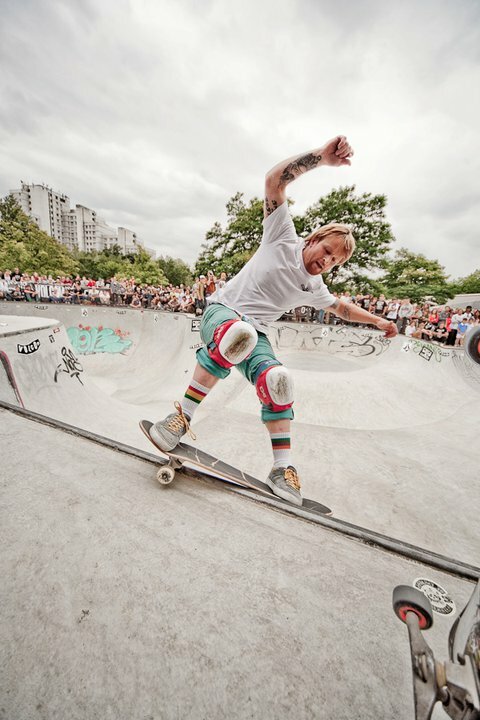 Last Week-End, on July 16th and 17th, the Berg Fidel skatepark in Munster, Germany was the place to be if you are an aficionado of bowl riding. The place yielded a powerful skateboarding contest between skaters from all over the globe during the Annual Volcom Bergfest. The notorious Monster Bowl and Snake Run was grinded in style thanks to a nasty outbreak of persistent aerials, relentless FS and BS, obstinate tail grabs, ruthless ledge riding and more. More than 1,500 spectators had turned in to see the "Volcom Mountain Festival" from C1rca. Some of the best skateboarder dared to show in the newly renovated concrete landscape. And after intense contest in the A Division (the Pros), two Americans and one German landed in the top three. Twenty One year old Ben Hatchell from Manassas, Virginia, came in first and his counterpart 21 year old Robbie Brockel from Phoenix, Arizona came in third. But at the end, it was Ben Hatchell who showed his superiority: he landed massive Bs Ollie in the direct path of the monster in the Bowl Corner and even nailed a MC Twist into the Deep End. Result: 1 Place and $ 2,000 prize money for the American. For those who missed Hatchell's performance at Bergfest, there will be other opportunities to see him: he will participate at the Dew Tour Bowl contest in Ocean City, later this month he will be at the X Games in L.A. and eventually in August, he will show-up at Coastal Carnage in Huntington Beach (which he won last year). Second place was awarded to 18 year old Robin Mentrup from Munster, Germany. 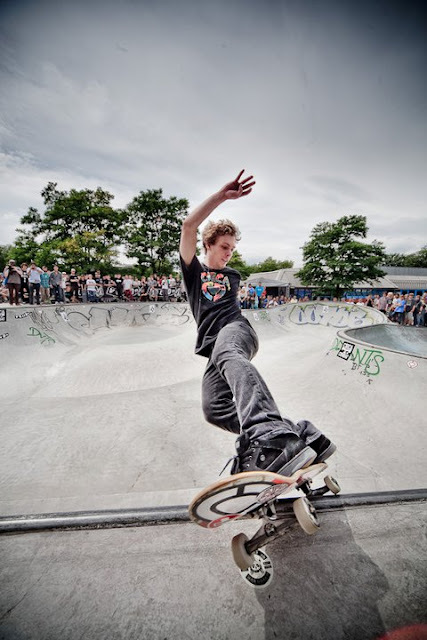 Robin was one of the youngest people to land in the top six of at this year's Shredfest. The third place went to Robbie Brockel a Cowtown sponsored rider. You may remember Robin Mentrup for his 380 ollie big flip that earned best trick kudos at the 2008 Phoenix Am. While other high-speed Tellen Smith Grinds onto Coping hurled by Ben HatchellIn the Masters 35 years and older Division all top three slots went to Germans. Forty-Two year old Anders "Pool Panic" Tellen landed in the first place. He has Skull Candy, Independent and Old Man Army as some of his long line of sponsors. The high-speed Anders Tellen was followed into the winner's circle by 38 year old Thilo Nawrocki from Dusseldorf. Nawrocki is on the Pavel Skateboard's Pool Team and usually always answers yes to a good bowl sesh. Eventually, forty-one year old Jason Parkes landed third. Jason Parkes was born in San Diego, California but lives in Stuttgart, Germany where he is sponsored by Kiste Skateshop. He started skateboarding at 7. His major sponsor is Hoax Mfg.. The Master's Division was not the only one to be dominated by the Germans: the other competitions were ripped properly. Munster Mad-Man came in the Christian Krause Pavel "Death Race" and live as the fastest across the finish line, thus securing the first place, while next door, threw the cat in the Street "Battle at the Mountain Rail" over the bar. Coming as a big surprise in the 4th place, nine year old Nathan Koop from Essen was certainly cashing some hard trained hours with his big spins. The spunky sprite gave everyone in the youth division something to think about with his high flying maneuvers. The podium went to 14 year old Johannes Haist from Karlsruhe. Haist is sponsored by Pavel Skateboards and has been making quite a name for himself on the international skateboarding scene. In 2010 he took home first place at the Fest Hard Cup Mini Ramp Division in the Netherlands. Two 15 year olds from Munster took the rest of the podium: Sergej Udarcev and Mathis Wenner. At the end the Germans won both the Unsponsored and Youth Divisions as well. 24 year old Lucas Axman from Konstanz took top accolades in the Unsponsored Division besting 17 year old Fabian "Bobo" Wenzel of Munster and 22 year old Oliver Hafner from Krefeld. No, Dave Duncan was not there to shout his famous motto, but there was no less than McRad and the U. S. Bombs on the stage and in the strings. They braved the rain and felt completely at the legendary sessions before the Mastership recalls. Bowls, beers and punk rock – that’s was the Bergfest was all about, and when it comes to beer, you can trust the Germans!!! The Bergfest Battle Is Over ... for this year!